At the end of four hours of competition that included negotiating hairpin bends, steep jumps and obstacles over dirt terrain, all at breakneck speed, motorcycle racing freaks were left awestruck. 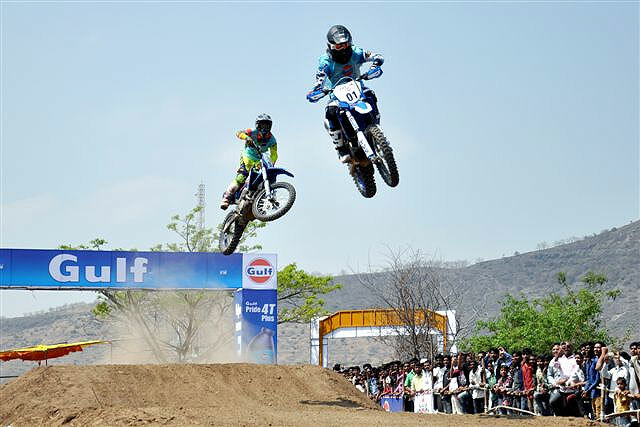 If you are one of those who thrills on motorcycle daredevilry then you should have been there in Nashik over the weekend for the Gulf Supercross. 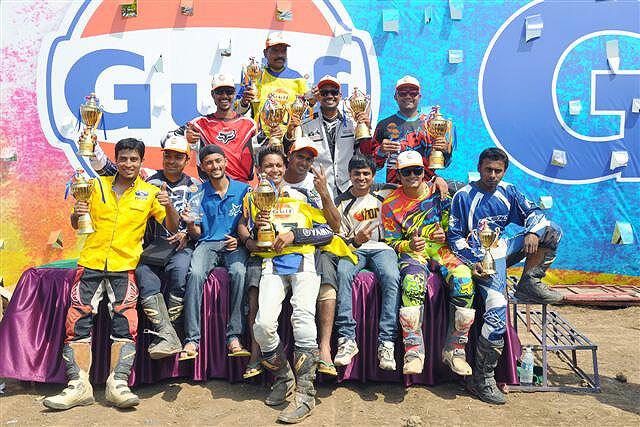 Organised by Sportscraft in association with the Nashik Automotive Sports Association, the event left racing freaks in awe of riders from all over the country who went through an exercise in off-road, dirt riding. There were 96 entries for the various motos in the Gulf Oil-sponsored event and each came up with an awesome display in the finer nuances of off-road riding at Kute's Supercross Track. At the end of four hours of competition that included negotiating a hairpin bends, steep jumps and obstacles over dirt terrain, all at breakneck speed, it was the TVS Racing riders from Bangalore who emerged best of the lot. Bangalore riders K P Aravind, Harith Noah, Pramode Joshua and R Natraj, all astride TVS RTR bikes, gave the goodly Sunday crowd that gathered for an usual spectacle in rural surroundings much to shout about as they covered the dusty, serpentine course with aplomb. With a dust cloud overhead, riders had to negotiate a dicey course. After taking a massed start they had to race against each other and also clear the steep inclines and obstacles along the 800 metres dirt terrain course. Though most exercised utmost caution and maintained the right balance and speed, quite a few took a tumble, particularly while landing after a steep jump. But that was mainly because of their inexperience in the motorsport off-shoot of Supercross. Narith Noah won the first moto in the glamour event, Indian Expert Foreign Class, for motorcycles upto 500cc, beating back a stiff challenge from his TVS Racing teammates Aravind and Joshua, who finished in the second and third places respectively. However, Aravind extracted revenge by winning the second moto in the category at the fag end of the day’s programme. In a thrilling finish, Aravind sneaked past Noah, cutting past him around a hairpin bend on the second last lap of the nine-lap race, to emerge triumphant. Joshua took third place. The result saw Noah and Aravind share the top place in the overall standings of the Indian Expert Foreign Class, for motorcycles upto 500cc. 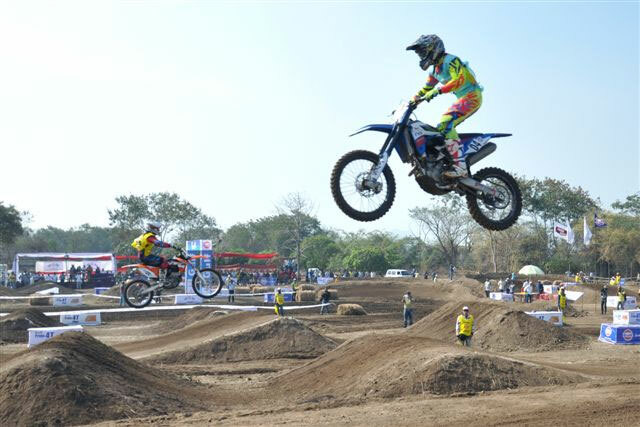 Aravind, however, was a class above the rest of the field in the Indian Expert Classs upto 260 cc, taking both the motos. Joshua placed second, with Natraj and S Madhu, also of TVS Racing, sharing third place in the overall standings. Nagpur’s Jignesh Patel won the Private Foreign motorcycles 250cc class. 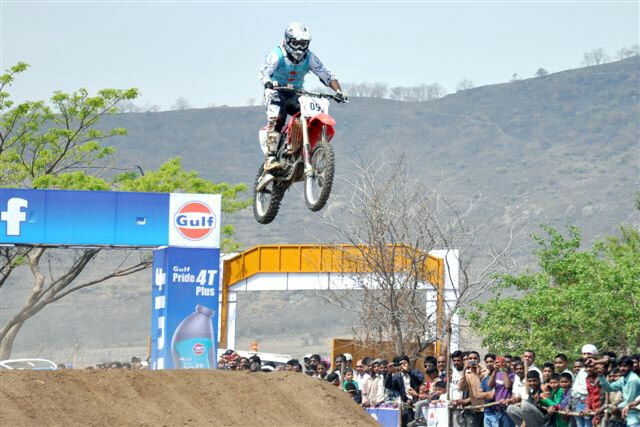 Astride a KTM SXF, he won both the motos, with Abhijitsinh Jadav of Pune (Yamaha RX 135) placing second and Ganesh Lokhande, astride a Honda CRF, third. 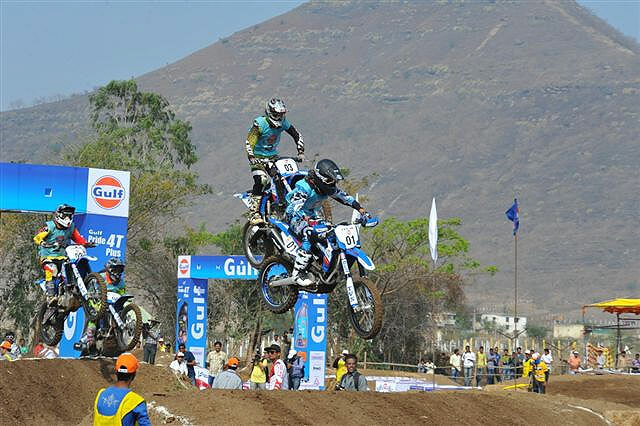 Mumbai’s Kshitij Shukla won the Novice class, with Bhopal’s Syed Asif Ali and Pune’s Mohammed Faisal placing second and third respectively. Aurangabad’s Aakash Satpude (TVS Apache) won the Private Expert upto 260cc class, with Narendra Singh Pawar of Indore and Shamlal Pardeshi of Punce second and third respectively. A heartening part of the event was the kids demo class. The crowd could only applaud as boys in the age group of 10 and 15 went through the motions. Ten-year-old Yuvrajsinh Kondedeshmukh showed potential of a champion rider in the making as he negotiated the jumps, sometimes taking two hurdles in his stride. Fourteen-year-old Yash Pawar too was impressive, particularly while negotiating the tabletop jump. In sum, it was an event to remember for motorcycle racing freaks. The riders were all praise for Kute’s track. Prepared by a team of local riders, it had as many as 12 steep jumps and a lovely table top stretch that proved challenging. While for most it was a rare experience to drive a dirt track competition for the first time, none had anything to complain about despite the pounding and abuse they and their bikes were put through. If anything, there was only appreciation, and an appeal for more of it!